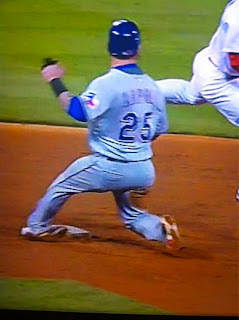 Mike Napoli's Ankle Must Be Made of Jello (GIF) - Fantasy Football, Fantasy Football Rankings | Mac Bros.
Texas Rangers catcher Mike Napoli must be made of Jello. Or at least his ankle must be. Because THIS (look above) doesn't seem possible. Napoli injured it while rounding the bag in the fourth inning of Game 6 of the World Series. A concerned Ron Washington and the trainer came out of the dugout to likely carry him screaming off the field, but Napoli stayed in the game. We kid you not.